Jim Curtin will remain the Philadelphia Union’s manager. 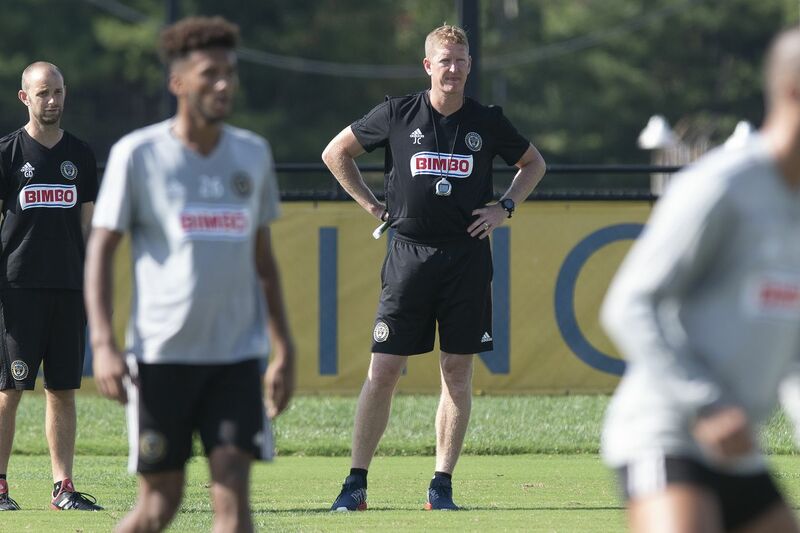 Jim Curtin will remain as the Union's manager next season, as sporting director Ernst Tanner decided to give the Oreland native a new one-year contract. "We have agreed on continuing our collaboration," Tanner said at a news conference Monday. He cited Curtin's having made the playoffs twice in the last three years, and his fourth-place finish in MLS' Coach of the Year vote — "an external view," Tanner said. "With relation to the players, from all that I have seen here, he is very, very good, and he's an expert in developing young players, which will be a clear focus in the future as well," Tanner added. "I would say, given this, we should work together. … If it is going well, we can prolong it." Though Curtin will be back, many players from this year's team won't be. The Union declined 2019 contract options on eight players: goalkeeper Jake McGuire; defenders Fabinho, Richie Marquez and and Josh Yaro; midfielders Marcus Epps, Fabian Herbers and Adam Najem; and forward Jay Simpson. Fabinho might come back on a cheaper contract. The Union said they are in negotiations with him on a new deal. Simpson's departure will free up a lot of cap space. Signed in January 2017 to be the team's top striker, he never came close to that, scoring just three goals in two years on a salary of more than $600,000. Yaro goes down as the biggest bust. He was the No. 2 pick in the 2016 draft, but a series of injuries left him unable to fulfill his potential. McGuire might not be the only goalkeeper leaving, as longtime backup John McCarthy is out of contract. Tanner said the North Catholic and La Salle product "wants to play, and I think we should respect this." Veteran right back Ray Gaddis and defensive midfielder Warren Creavalle are also out of contract. Tanner said Creavalle already has a contract offer from elsewhere. Seven players saw their options picked up: defenders Jack Elliott, Olivier Mbaizo, and Keegan Rosenberry; midfielders Ilsinho, Derrick Jones, and Fafa Picault; and forward Cory Burke. The team hasn’t yet decided whether to retain forward Kacper Przybylko. Borek Dockal's future also remains in question. The Chinese club that owns the Czech playmaker's rights has the upper hand now that his loan here is over. Tanner also acknowledged that Dockal wants to go back to Europe, as a Czech newspaper reported earlier this month. In particular, Dockal's old club Sparta Prague would like to bring him back, and Dockal's agent has talked to the club about a reunion. "We don't have it in our hands," Tanner said. "We are in touch with the agents, and there will be a possibility to bring him back. … Borek also told us about his situation and his wish to return to Europe. That's also something we need to take into account and respect. But if there is a chance to bring him back, we would do it." There will be one change to the coaching staff: Goalkeeper coach Tim Hanley has departed. Tanner said he knows whom he wants to hire for the position, and might have a deal done next week. Ten players are guaranteed for next year: goalkeeper Andre Blake; defenders Mark McKenzie, Matt Real, and Auston Trusty; midfielders Brenden Aaronson, David Accam, Alejandro Bedoya, Anthony Fontana, and Haris Medunjanin; and forward C.J. Sapong.